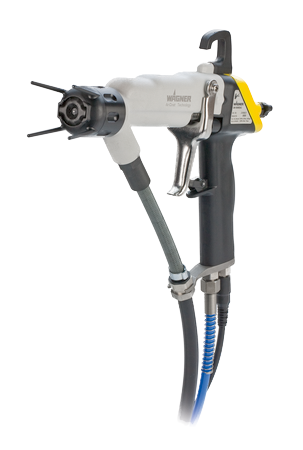 Electrostatic manual gun for Airspray applications with water-based material and internal charging. Electrostatic manual gun for Airspray applications with separating agent & water-based lacquers and internal charging with integrated high-voltage cascade. 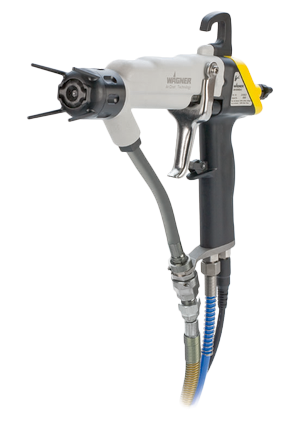 Electrostatic spray gun for Airspray automatic applications with solvent-based material. Electrostatic spray gun for Airspray automatic applications. 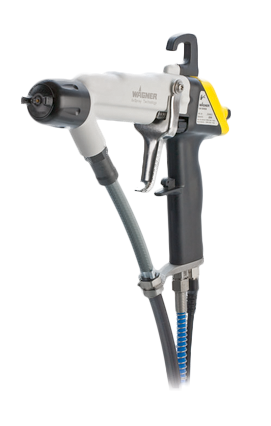 Electrostatic manual gun for AirCoat applications with water-based material. 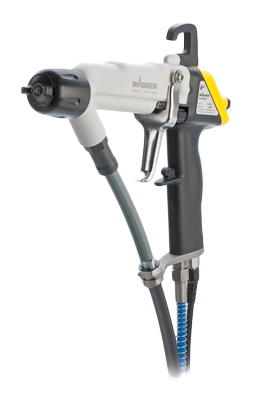 Electrostatic manual gun for AirCoat applications with separating agent & water-based lacquers and internal charging with integrated high-voltage cascade. Manual or automatic control via external interface. Slim cabinet for the electrostatic processing of water-based lacquers with max. two automatic guns. Completely insulated construction with internal charging of the materials for manual spraying applications, Airspray and AirCoat. Suitable for low pressure guns (GA 2800EAW & WA 900) or high pressure guns (GA 4000). Large cabinet for the electrostatic processing of water-based lacquers with max. two automatic guns. Completely insulated construction with internal charging of the materials for manual spraying applications, AirSpray and AirCoat. Suitable for low pressure guns (GA2800EAW & WA900) or high pressure guns (GA 4000). With the Evobell 3000, WAGNER has developed a new generation of high-speed rotary atomizers that set new standards in the areas of surface finish, lacquer saving, reliability, safety and ease of servicing. The atomizer bell, broken down into bell and distributor, guarantees quick inexpensive adaptation to the product being atomized. Only the distributor needs to be changed! The unique design of the distributor allows optimal cleaning and flushing of the atomizer bell and distributor. With the Evobell 3500, WAGNER has developed a new generation of high-speed rotary atomizers that set new standards in the areas of surface finish, lacquer saving, reliability, safety and ease of servicing. The atomizer bell, broken down into bell and distributor, guarantees quick inexpensive adaptation to the product being atomized. Only the distributor needs to be changed! The unique design of the distributor allows optimal cleaning and flushing of the atomizer bell and distributor. Electrostatic Spray Systems offer incredible benefits over traditional air spray. Our vast knowledge base helps you select the best product for the application.